The 7.62×54mmR is a rimmed rifle cartridge developed by the Russian Empire and introduced as a service cartridge in 1891. Originally designed for the bolt-action Mosin–Nagant rifle, it was used during the late Tsarist era and throughout the Soviet period to the present day. The cartridge remains one of the few standard-issue rimmed cartridges still in military use and has the longest service life of all military-issued cartridges in the world. Soviet World War II era service cartridges: (Left to right) 7.62×54mmR, 7.62×39mm, 7.62×25mm. 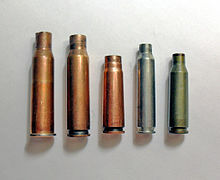 Modern service rifle cartridge cases: (Left to right) 7.62×54mmR, 7.62×51mm NATO, 7.62×39mm, 5.56×45mm NATO, 5.45×39mm . The American Winchester Model 1895 was also chambered for this cartridge per a contract with the Russian government. The 7.62×54mmR is still in use by the Russian military in the Dragunov and other sniper rifles, as well as some modern general-purpose machine guns like the PKM and Pecheneg machine gun. Originally, the round was designated as "Трехлинейный патрон образца 1891 года" – (Three-line cartridge model of 1891). It then became widely known under the designation "7,62мм винтовочный патрон" (7.62mm rifle cartridge). The round has erroneously come to be known as the "7.62mm Russian" (and is still often referred to as such colloquially), but, according to standards, the "R" in designation (7.62×54mmR) stands for Rimmed, in line with standard C.I.P. designations. The name is sometimes confused with the "7.62 Soviet" round, which refers to the rimless 7.62×39mm cartridge used in the SKS and AK-based (AK-47, AK-15, AEK-973) rifles. The 7.62×54mmR is the oldest cartridge still in regular combat service with several major armed forces in the world. In 2011, the cartridge reached 120 years in service. As of December 2013[update] the 7.62×54mmR is mainly used in designated marksman/sniper rifles like the Dragunov sniper rifle, SV-98 and machine guns like the PKM. 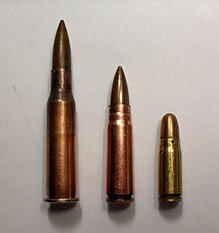 Because of performance similar to the American .30-06 cartridge the 7.62×54mmR is nicknamed "the Russian .30-06" by some. It is also one of the few (along with the .22 Hornet, .30-30 Winchester, and .303 British) bottlenecked, rimmed centerfire rifle cartridges still in common use today. Most of the bottleneck rimmed cartridges of the late 1880s and 1890s fell into disuse by the end of the First World War. The .30-06 Springfield cartridge (7.62×63 mm), with its higher service pressure and case capacity, will outperform the 7.62×54mmR when same-length test barrels are used, though this is very uncommon as .30-06 Springfield firearms are generally sold with much shorter barrels than 7.62×54mmR firearms. Commonly available 7.62×54mmR 150 gr (9.7 g) commercial ammunition chronographs around 3,000 ft/s (914 m/s) from the typical Mosin-Nagant (29") barrel, while the heavier 180 gr (11.7 g) loads chonograph in the low 2,700 ft/s (823 m/s) range. This is identical to .30-06 Springfield performance from a 24" barrel and slightly better than .30-06 Springfield performance from a 22" barrel. The 7.62×54mmR originally had a 13.7 g (210 grain) "Jager" round-nosed full metal jacket (FMJ) bullet. The projectile was replaced in 1908 by the 9.61-gram (148.3 gr) Лёгкая Пуля (Lyogkaya pulya, "Light Bullet") spitzer bullet, whose basic design has remained to the present. The Lyogkaya pulya, or "L"-bullet, had a ballistic coefficient (G1 BC) of approximately 0.338 and (G7 BC) of approximately 0.185. Most 7.62×54mmR loads are slightly superior in power compared to the much later developed the 7.62×51mm NATO, with its higher service pressure and lower case capacity. However, due to the rimmed design of the 7.62×54mmR round, reliability is lower by about 17.2%, compared to the 7.62×51mm NATO, with more jams and malfunctions experienced in auto-loading firearms. This doesn't by any means indicate it is a bad cartridge, just one where more care must be taken loading it into box magazines. When brought down to basic levels, choice between the two are majorly by preference. To increase accuracy for the Dragunov SVD, the Soviets developed the 7N1 variant of the cartridge in 1966. The 7N1 was developed by V. M. Sabelnikov, P. P. Sazonov and V. M. Dvorianinov. It used match-grade extruded powder instead of the coarser ball propellant and had a 9.8 g (151.2 gr) boat-tailed FMJ jacketed projectile with an air pocket, a steel core and a lead knocker in the base for maximum terminal effect. It had a ballistic coefficient (G1 BC) of approximately 0.411 and (G7 BC) of approximately 0.206. Produced by "Factory 188" (Novosibirsk Low Voltage Equipment Plant), cartridges are only head-stamped with the number "188" and the year of manufacture. It came packaged 20 loose rounds to a paper packet, 22 packets to a metal "spam" tin, and two tins per wooden case for a total of 880 rounds. The individual paper packets, hermetically sealed metal 'spam' cans, and wooden shipping crates were all distinctly marked Снайперская (Snaiperskaya, the adjective form of "Sniper"). Even the wax wrapping paper for the paper packets was covered in red text to make sure it wasn't misused. As hard body armor saw increasing use in militaries, the 7N1 was replaced in 1999 by the 7N14 special load developed for the SVD. The 7N14 round is loaded with a 9.8 g (151.2 gr) projectile containing a sharp hardened steel penetrator to improve penetration which is fired with an average muzzle velocity of 830 m/s (2,723 ft/s), for a muzzle energy of 3,375 J (2,489 ft⋅lbf). The 7.62×54mmR has 4.16 ml (64 grains H2O) cartridge case capacity. The exterior shape of the case was designed to promote reliable case feeding and extraction in bolt-action rifles and machine guns alike, under challenging conditions. The cartridge's shape remains the same to the present day. 7.62×54mmR maximum C.I.P. cartridge dimensions. All sizes in millimeters (mm). Americans would define the shoulder angle at alpha/2 ≈ 18.5 degrees. The common rifling twist rate for this cartridge is 240 mm (1 in 9.45 in), 4 grooves, Ø lands = 7.62 mm (0.300 in), Ø grooves = 7.92 mm (0.312 in), land width = 3.81 mm and the primer type is Berdan or very rarely Boxer (in large rifle size). According to the official C.I.P. (Commission Internationale Permanente pour l'Epreuve des Armes à Feu Portatives) rulings the 7.62×54mmR can handle up to 390.00 MPa (56,565 psi) Pmax piezo pressure. In C.I.P. regulated countries every rifle cartridge combo has to be proofed at 125% of this maximum C.I.P. pressure to certify for sale to consumers. This means that 7.62×54mmR chambered arms in C.I.P.-regulated countries are currently (2014) proof tested at 487.50 MPa (70,706 psi) PE piezo pressure. The attainable muzzle velocities and muzzle energies of the 7.62×54mmR are comparable with the 7.62×51mm NATO cartridge. The spitzer bullets used in the military variants have a particularly elongated shape which results in a favorable ballistic coefficient and sectional density, contributing to an adequate long-range performance and energy retention. When used with modern hunting bullets, the 7.62×54mmR is capable of taking game in the medium- to large-sized class (CXP2 and CXP3). The 7.62×54mmR can offer very good penetrating ability due to a fast twist rate that enables it to fire long, heavy bullets with a high sectional density. In Russia, the 7.62×54mmR is commonly used for hunting purposes, mostly in sporterized Mosin–Nagant rifles and civil Dragunov variants (Tigers). From left to right: L type bullet with lead core, LPS bullet with steel core aside, green tip T-46M tracer with tracer cup (opened both at top and bottom) and lead tip aside, T-46 tracer with extended cup (opened only at the bottom). All bullet jackets and tracer cups are made from copper washed steel. The 7.62×54mmR rounds in use with the Russian Armed Forces are designed for machine guns and sniper rifles. 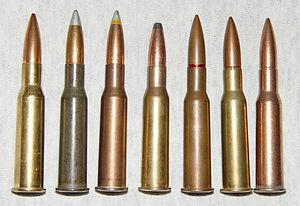 As of 2003, there were several variants of 7.62×54mmR rounds produced for various purposes. All use clad metal as case material. A conventional steel-core bullet designed to engage personnel and weapon systems. The bullet has a steel core and has a ballistic coefficient (G1 BC) of approximately 0.374 and (G7 BC) of approximately 0.187. The tip has no distinguishing colour. It can penetrate a 6 mm (0.2 in) thick St3 steel plate at 520 m (569 yd) and 6Zh85T body armor at 110 m (120 yd). An enhanced-penetration bullet designed to kill personnel wearing body armor, featuring a heat-strengthened core. The tip is uncoloured. A sealing lacquer belt on the mouth of the case is red-coloured. It can penetrate a 6 mm (0.2 in) thick St3 steel plate at 660 m (722 yd) and 6Zh85T body armor at 800 m (875 yd). Variant of the T-46, a tracer bullet designed for fire adjustment and target designation. The bullet has a green tip, and the tracer burns for 3 seconds. Variant of the B-32, an armor-piercing/incendiary bullet designed to defeat lightly armored targets. The bullet has a black-red tip. A sniper round designed for improved accuracy. The tip of the bullet is uncoloured. R50 at 300 m (328 yd) means the closest 50% of the shot group will all be within a circle of the mentioned diameter at 300 m (328 yd). R100 at 300 m (328 yd) means every shot of the shot group will be within a circle of the mentioned diameter at 300 m (328 yd). 7.62×54mmR is widely available both as military surplus and new production, but less so for match-grade rounds. Most surplus ammunition is steel-cased and uses Berdan primers, which effectively hinders its use for handloading. However, with the increased popularity of surplus Eastern-bloc Mosin–Nagant, SVT-40, and PSL rifles in the United States, Boxer-primed ammunition and unfired cases are increasingly available; these cases take large rifle primers. 6.5×54mmR: necked-down version, used in both converted Mosin biathlon rifles and Vostok-brand biathlon rifles in the 1960s and 1970. The American Winchester Model 1895. Approximately 300,000 made for the Russian army in 1915–16. Type 67 machine gun and Type 80 machine gun. ^ "Rifle ammunition — Sellier & Bellot". Sellier & Bellot. Archived from the original on 2015-03-21. Retrieved 17 March 2018. ^ "Wolf Gold ammunition in a reloadable brass case". wolfammo.com. Archived from the original on 2009-05-01. Retrieved 17 March 2018. ^ Barnes, Frank (2006). Skinner, Stan (ed.). Cartridges of the World. 11th Edition. Cartridges of the World. Gun Digest Books. p. 295. ISBN 978-0-89689-297-2. ^ William C. Davis Jr. (1986). Handloading. p. 191. ISBN 0-935998-34-9. ^ "C.I.P. TDCC sheet 7.62 × 54 R (indisputable legally binding dimensions and data for civilian use in Russia)" (PDF). cip-bobp.org. Retrieved 17 March 2018. ^ "Brown Bear 7.62x54r 203 gr. SP". 7.62x54r.net. Retrieved 17 March 2018. ^ "LVE Novosibirsk Cartridge Plant: 7,62mm rifle cartridge with steel core bullet". www.lveplant.ru. Retrieved 17 March 2018. ^ Erik Lawrence (2015). Practical Guide to the Operational Use of the RPD Machine Gun. Erik Lawrence Publications. p. 17. ISBN 978-1-941998-35-9. Accurate (2000). Accurate Smokeless Powders Loading Guide (Number Two (Revised) ed.). Prescott, AZ: Wolfe Publishing. p. 286. Barcode 94794 00200. Wikimedia Commons has media related to 7.62x54 mm R.